I thought the exchange with my wife was funny, so I drew a comic strip out of the conversation. On a slightly serious note, it was actually not so long ago when software engineers solely decided how the human computer interaction should look like. And the graphical user interface was terribly done quite often. So, even now, we may not have a slight hesitation in blaming the engineers on subpar product experiences. These days, most (?) companies have UX designers and product managers. Often, engineers' responsibility is to simply take specifications and convert into code. 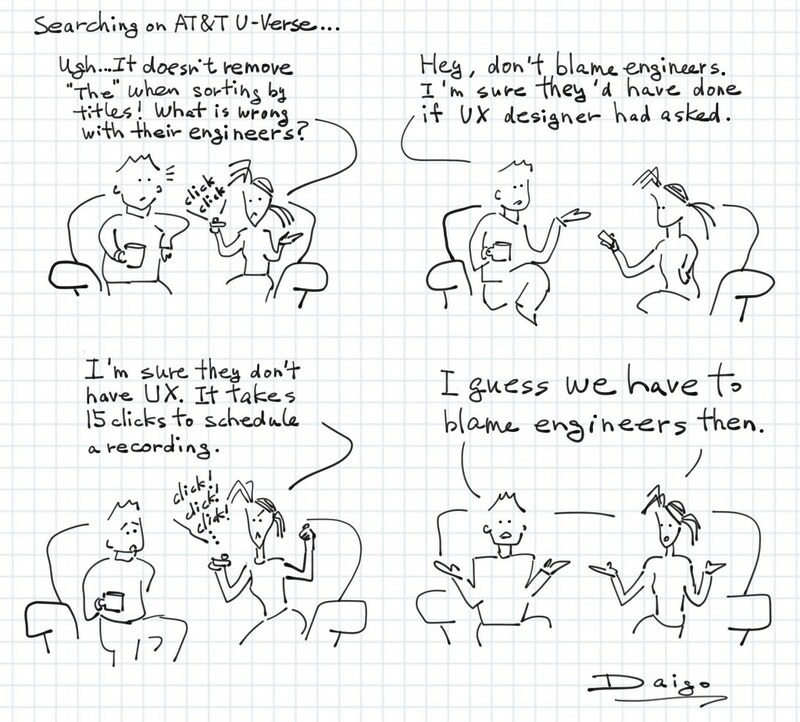 At FiveStars, we did not have a UX designer when I joined over 3 years ago. We, handful of developers, did everything from the interaction design, asset creation, coding, and all the way to QA and release, and perhaps even visiting the clients for installations. Those hard and fun days are over: Now we have whole product team comprised of talented product managers, UX designers, QA, and engineers. The depth of the knowledge and skills they possess are humbling me, and they put our early products to shame. Instead of doing everything by ourselves, we work as team now. Developing a great product takes effective cross-functional collaborations among talented contributors. I have a great appreciation to the team especially because I did everything by myself at least once...badly. Thanks Eric Leung for correcting a grammatical error.